The documentary “Etched in Glass The Legacy of Steve Ross” shows Ross (third from left), a Holocaust survivor, at Dachau, one of the Nazis’ concentration camps. He spent his adolescence shuttling among 10 different concentration camps, dodged death at Auschwitz, endured beatings and near-starvation, and escaped — only to land back in the Nazis’ hands. But the moment that’s forever burned in Stephan Ross’s memory was the day of his liberation at Dachau, when a US Army lieutenant jumped down from his tank and hugged the emaciated 14-year-old. It was a brief encounter — the soldier gave Ross some of his food and a handkerchief decorated as an American flag. The two parted, never to meet again. For decades, Ross never knew the soldier’s name, but he used that moment of compassion as a lodestar to guide his life after those terrible early years. Ross became a social worker in Boston, helping troubled youth. And he spent seven decades pursuing the identity of his liberator. 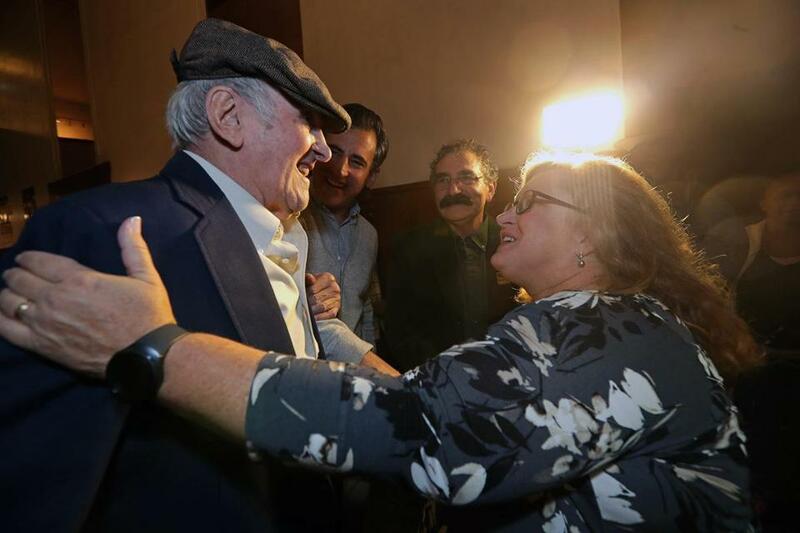 Now, his intense personal journey has been documented in a film, “Etched in Glass: The Legacy of Steve Ross.” It was previewed Wednesday night at the West Newton Cinema in an event that drew other Holocaust survivors, former governor Deval Patrick, and Newton Mayor Setti Warren. “A man who suffered inexplicable horror, was rescued and saved, then turns around and dedicates his life to others — that is why we should have inspiration and hope today,” Warren said at the movie showing. The film uses intimate interviews with friends, family, and Ross himself, set against photos and videos of Ross’s life, to chronicle his journey from Dachau to Boston. 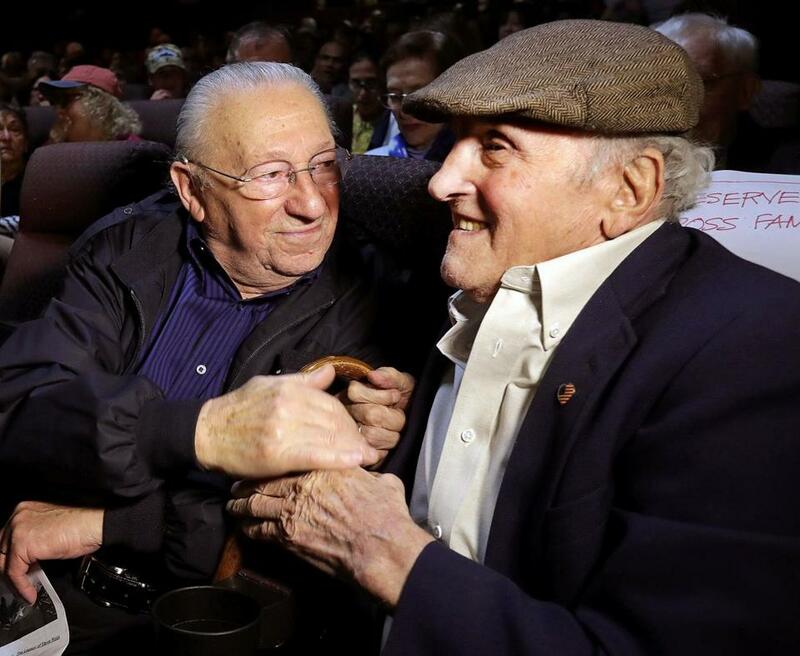 Ross (right) shared a moment with another survivor, Israel Arbeiter, at the film’s screening. 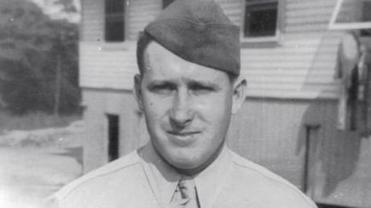 At the theater, Ross was surrounded by many of those same family and friends, and most important, the relatives of Lieutenant Steve Sattler, whose identity Ross would come to know only after his death. Sattler was a farmer from Unionville, Mich., described by his daughter as a witty raconteur, always ready with a joke or a light story. But a few months before her father’s death in 1986, he told her the story of his interaction with a boy at Dachau when he was a 29-year-old soldier. “I tried to put myself in his shoes,” Gwen Sattler Allanson said. “He must have been watching the people marching out of the camp, and I wonder, it had to be something so upsetting about seeing this young boy in the condition he was in. What would make a soldier get off his tank and specifically choose that boy? Still more years later, Ross appeared on a television show, “Unsolved Mysteries,” to broadcast his search for his liberator. Members of the Sattler family saw the episode, and his granddaughter contacted Ross, their meeting captured in the film as the culmination of his 67-year search. In a series of emotional interviews in the documentary, filmed over nearly a decade by Boston director Roger Lyons, Ross recounted the moments of horror from his early life. Ross was born outside of Lodz, Poland, into a large Jewish family. His parents entrusted the boy to a Christian family after the Nazis invaded. But fearing retribution, that family sent Ross to live in the nearby woods, where he was eventually captured and at age 9 sent to the first of a long line of concentration camps. In the film, Ross recalled hiding from a death squad in the raw waste in a latrine, being beaten with a lead pipe until his back broke, and being forced to drink chemicals as part of the Nazis’ scientific experiments. At Auschwitz, Ross was herded into a line with hundreds of other children deemed unfit to work and targeted for death. He slipped out of line undetected, crawled into a rail yard, and clung to the underside of a departing train. He held so tight, he said, that his fingers and feet turned blue. 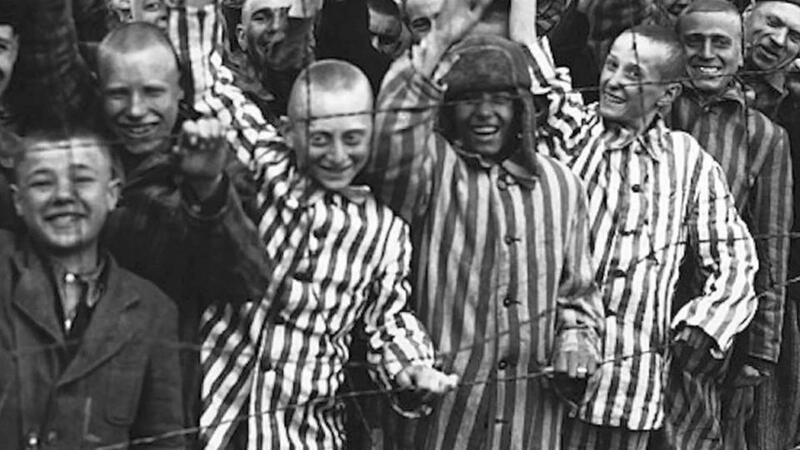 It was a fleeting freedom that ended cruelly: When the train arrived at its destination, Ross found himself at Dachau, where an estimated 32,000 prisoners died. It would be another year before the Nazis’ regime collapsed, the US Army rolled up to his camp, and Lieutenant Sattler hopped down from his tank. That moment, Ross said, changed the trajectory of his life. “If I could find that soldier, I would say to him that what he has done for me, I emulated, and that I love people because of him,” Ross says in the movie. 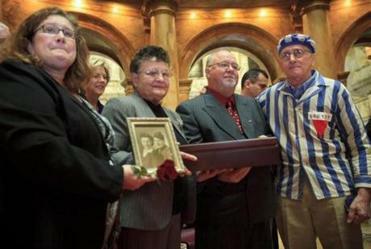 At a 2012 Veterans Day ceremony, Gwen Allanson held a picture of her late father, Steve Sattler, with siblings Stephanie Sattler and James Sattler. At far right is Stephan Ross. His parents and six of his siblings were killed in the Holocaust; another brother survived. Ross was relocated to the United States and settled in Dorchester. He eventually earned a master’s degree in psychology and began a 40-year career in Boston mentoring troubled teens from housing projects. He also visited low-income high schools, often dressed in the striped shirt and pants the Nazis made concentration camp prisoners wear. He was also the driving force behind the New England Holocaust Memorial in Boston. He raised a family, too; his son, Michael Ross was a Boston city councilor and candidate for mayor. Now a lawyer, the younger Ross occasionally writes op-ed columns for The Boston Globe. On Thursday, he carried on his father’s tradition, visiting Jeremiah Burke High School in Boston with members of the Sattler family. In an interview featured in the film, Steve Buckley remembers the impact Ross had on him as a troubled teenager in the D Street housing project in South Boston. He said that without Ross, he never would have gone to college and gotten a law degree. Buckley is an attorney specializing in worker’s compensation issues. The director and producer of the film, Roger Lyons, hopes to distribute it nationally, so that “the world can never forget” the story. Ross’s life will also be chronicled in a book set to be published in 2018. Michael Ross said it is important that new generations come to appreciate the crucial point of his father’s experience. “As much as my father was a victim of events that occurred against him and his family and our people, he is also the beneficiary of just a few kind acts that also transformed his life for the better,” Michael Ross said. Stephan Ross greeted Gwen Allanson, daughter of Steve Sattler, who rescued Ross at Dachau. At rear is his son Mike Ross and film director Roger Lyons.